Pollution as one of the pressing concerns of the country has been consistently poses a lot of threats to environment as well as hazards to human health and welfare. This is manifested by the prevalence of diseases and the quality of environment incurred by the unconcerned and irresponsible citizens. The pollution problem should not be shouldered by a sole agency directly controlling it. The Department of Environment and Natural Resources which is the lead implementing agency should be assisted by other government agencies, local government units and now government organizations to create and set-up guidelines in its control and management. Disseminating what you learned will increase public awareness regarding the ill-effects of pollution to health. Dissemination of information will also be an instrument in helping implement such strategies contributory to the solution of the problem. Improper disposal of human excreta and sewage has been responsible for many epidemics on record which have brought sickness and death to large number of people. It is also one of the most important factors responsible for the high incidence of gastro-intestinal infections including intestinal paratism in a community. Moreover, it brings about unsightly conditions and foul colors which are definite nuissance to any community. The improper storage and disposal of waste material or refuse is also responsible for the spread of communicable diseases and production of insects such as flies, rats, mosquitoes, etc. It will also create foul odor in the community. Food sanitation deals largely with health hazards and the sanitary features of food handling. It also concerns with the quality and protection of food values, and with technological and even economic aspects of the food handling processes to fully accomplish its aim of disease prevention. The control of rodents, insects and related household pests, commonly called vectors, have public health significance for they are also cause of spread of communicable diseases. It is important to minimize their number and/or eliminate them from household premises. a. Garbage - left-over vegetable, animal and fish material from kitchen and food establishments. These materials have a tendency to decay giving off foul odors. They also serve as food for flies and rats. b. Rubbish - waste material such as bottles, broken glasses, tin cans, waste papers, discarded porcelain wares, pieces of metal, and other wrapping materials. c. Ashes - left over from burning of wood and coal. Ashes may become a nuisance because of the dust associated with them. d. Dead animals - dead dogs, cats, rats, pigs, chickens usually run over by vehicles on streets and public highways. They also include small and other large animals that died from diseases. e. Stable manure - animal manure from stables. f. Street sweeping - dust, manure, leaves, cigarette butts, waste papers, and other materials that are swepts from streets. g. Night soil - human waste normally wrapped and thrown into sidewalks and streets. h. Yard cuttings - leaves, branches, grass, and other similar materials produced during cleaning of gardens and also after storms. The amount of refuse produced is affected by many factors such as climate, season of the year, industries present, economic condition of the family, and geographical location. The satisfactory handling of refuse may be considered under three headings, namely: storage, collection, and disposal. The proper storage of waste material or refuse is very important if we are to prevent flies, rats, and other insects from being attracted to these wastes and prevent foul odors. a. Small enough to be easily carried when filled with waste. c. Provided with tight-fitting covers so that flies and rats cannot get in and so that fouls odors in the home and community can be reduced. d. Made of such materials that are not easily destroyed by dogs, cats, pigs, and rats. Wood and metal are satisfactory materials for containers. For waste papers, wire baskets are satisfactory. f. Preferably placed on an elevated platform so that it is easy to see and sweep waste materials that scatter around the container. Where there is no public refuse collection system, a member of the family or a family helper regularly collects the accumulated refuse in the home for final disposal. 2. Transportation of the collected refuse to the final disposal rate. 1. 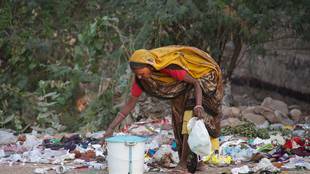 Frequent collection of refuse, especially garbage is necessary for good sanitation. 2. A longer interval between collection creates problems of storage and foul odors for the homeowner. 3. It is necessary to cover the refuse in the vehicles during transportation to final disposal sites to prevent flies, minimize odors, and remove traveling "eye-sores". 4. It is important to have adequate and properly maintained collection carts, trucks or other vehicles to eliminate collection delays and complaints from the inhabitants. 5. The route to the final disposal should be as direct as possible from the point of origin. However, it should preferably not pass busy streets. 6. Because of the nature of the waste materias, it is preferable to have collection done at night. The sanitary disposal of refuse needs much closer attention both by the homeowner and by authorities concerned when there is an existing public refuse collection and disposal system. a. Burial - Refuse us deposited in pits and covered with soil. The most frequent defect on this method as practiced in our homes is the inadequate soil cover, making possible the excavation of the buried refuse by dogs, cats, and other animals. Two feet soil cover is satisfactory to prevent excavation of the buried materials by these animals. b. Burning -This usally involves open burning on the ground and sometimes simple incinerators are used. In cities and other crowded communities, this method may create smoke or air pollution problems. c. Feeding to Animals - Leftover foods and other garbage materials can be made use of by feeding to pigs, chickens, and other poultry and livestock. d. Composting - Where garbage is not fed to animals and poultry, it may be composted, and the material used as soil conditioner and fertilizer. The simplest homecomposting method involves the deposition of garbage, leaves, other yard rubbish and animal manure into a pit and covered with soil, about two to three feet thick. e. Grinding and Disposal to Sewer -There are now commercially available machines known as "garbage grinders." These are attached to the kitchen sink. Leftover foods, including small bones, are ground into smaller particles and washed down into the waste-water pipes and finally into the septic tank or public sewage collection system. This is a very satisfactory and convenient method of disposing garbage. f. Sanitary Landfill - Also known as the "cut and cover," it was developed in na effort to overcome the objections to the unsanitary open dump. It is a method of refuse disposal developed because of the many defects of open dumping encountered in practice. In a sanitary landfill, there is a systematic excavation of the soil, deposition of the refuse, covering with soil and compaction of the soil cover. Mechanized equipment such as bulldozers and cranes are used to advantage. Recycling means to reclaim by using in the manufacture of new products. It is the recovery and reuse of any waste material of obvious economic importance where reusable materials are more available cheaply than fresh supplies of the same materials. The recycling principle is finding ever wider application in the conservation of the world's natural resources and in solving the problems of the wastes of a manufacturing process in the same process such as the remelting and recasting of metallic turning and off cuts is commonplace in industry. Recycling is also the recovery and reprocessing for reuse of "discarded" materials, such as wastepaper, scraped metals, and used glass bottles. The burning of garbage to produce electricity and the extraction of pure water from sewage and others are examples of recycling. Recycling waste and used material for some useful purpose is an effective means of conserving resources, of reducing waste disposal, and often of eliminating cost. For economic reasons, industries, reuse much of the scrap materials generated of their facilities. Some demolition materials and a larger amount of scrap of metal from automobiles are recycled. A small but increasing amount of residential and commercial wastes is currently recycled.